'A first novelty book about going on summer holiday, with push, pull and slide mechanisms.------Summer's here, and the days are full of fun and sunshine in Busy Holiday. Pack the car, splash in the sea, whoosh down a water slide then pitch a tent just in time for bed! This wonderfully illustrated novelty book by Sebastien Braun is perfect for sharing summer time with young children. 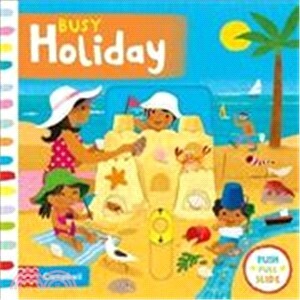 They will love to push, pull and spin the tabs and bring the summer holiday to life.